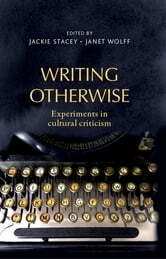 Writing otherwise is a collection of essays by established feminist and cultural critics interested in experimenting with new styles of expression. Leading figures in their field, such as Marianne Hirsch, Lynne Pearce, Griselda Pollock, Carol Smart, Jackie Stacey and Janet Wolff, all risk new ways of writing about themselves and their subjects. Aimed at both general and academic readers interested in how scholarly writing might be more innovative and creative, this collection introduces the personal, the poetic and the experimental into the frame of cultural criticism. This collection of essays is highly interdisciplinary and contributes to debates in sociology, history, anthropology, art history, cultural and media studies and gender studies.